Yup, same board. I 3d printed brackets and was able to mount it into an old Nikko receiver I've got. I though I posted that but maybe not. Anyways, it should be powered up for the first time soon. I want to have it done by the end of the month. I am waiting to see how it turns out w/great anticipation. Several of us are interested in buying some boards. So if you have a way to accept those pin arrangements... in your next board run.. I'd like a some. I got 91 tubes off of that same vendor for $40 plus shipping. Now I also have a lifetime supply. You can't hardly beat about 53 cents each! Did you contact the Ebay seller I posted above for the proper 8-pin round (B8D) sockets? Yes, they combine shipping. I am a tad low on funds right now, so I will order some in the near future. What do you mean they combine shipping? Who? They are from different vendors. The 7 pin sockets you showed are not going to be proper. 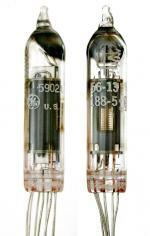 (if you want them for the 5902 tube )... they are from a different vendor. Perhaps you can cancel those and buy the correct round ones from the other vendor? The vendor that sells the round sockets will combine shipping if you buy more than 1. They have 35 in stock, so no worries. The 7 pin ones I can use on other projects. Question regarding this, are you guys wanting to use sockets? I can make the 6v6, 6aq5, and 5902 all fit the same area not using the socket for the 5902. To see if I can make one of the sockets fit could you tell me if the round sockets pins are spaced similarly to the 5902? The B8D socket holes are arranged to match the 5902 pins 1-8 in a circle with a gap. These pins show a .047" hollow canter. But the 5902 pins are thin wires... and I don't know their diameter. Perhaps that can be found on the 5902 data sheet? That works, ill just make sure the holes are big enough to take those socket pins. The pinouts are probably different as opposed to the 6V6 or 6AQ5 tubes, so rewiring would be in order. I already have some of these as I was curious about how they might be used. But I don't think they make too much sense. Maybe I just don't know how they were intended to be utilized best. The tube still gets soldered in. But it makes it easier to solder/connect a wire to each pin. But I still don't see or understand the best way to use these. 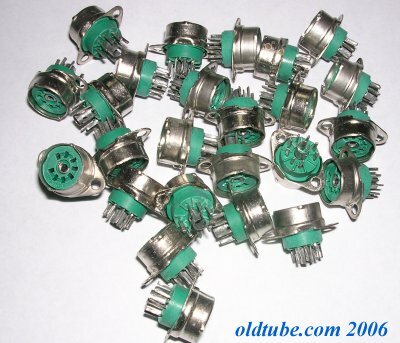 If you soldered pins into the outer holes, would you be able to plug it in to an octal socket? Maybe.... but I didn't measure for that. I don't know. But....where do I get pins like that to fit in the holes of an octal socket? ... and if that was the idea... ( a smaller substitute tube) then it would have to be a pin for pin identical tube... no? Or maybe the idea is that you can build a circuit for the submini tube and yet lay it out with octal sockets. Still a bit of a puzzle... maybe? However... when I look at the 2 large outer mounting holes... it seems that the idea was simply to use these devices mounted on a metal chassis like you would do for an octal..... but then you can solder the circuit wires to the large holes and the tube in the small holes. I suppose that you could also solder the 5902 wires into an octal tube socket, but change the position of the wires so that it would match a 6V6 pinout. For NOS tubes it looks like enough lead length, and use plastic sleeving over the wires. Only if you are trying to replace a 6V6 with a 5902. Which doesn't make sense since they have different ratings. The 6V6 and 6AQ5 however are perfectly swap-able.... except pin layout. So yes... certainly one could run the 5902 leads down into a regular octal socket and solder them to the ends of the pin-terminals on the socket. But it has nothing to do with a 6V6 per se, so the 5902 leads would go into octal sockets wired for the appropriate 5902 pins and associated circuit components. This particular thread is all about my 6V6/ 6AQ5 amp... and it uses almost the same schematic as my 5902 amp... but there are differences in B+ and bias settings and output transformer ...as well as power supply voltages. So I'm powering things up tonight to test for power consumption and make sure that I've got my low-voltage all figured out. Power up the solid state section of this amplifier with cold tubes and got 60mA at 30V. Pull the opamps and get the ~ 0.5mA I expect from the 44K virtual ground divider. Right channel opamp runs about 4mA. Turns out two traces that are supposed to pass by one another actually touch so the output of section B of the left opamp is running into the bias circuit for V4 and loading through the bias adjustment pot. Oops! Nothing a dremel won't fix tomorrow. Good troubleshooting... and progress. Yeah.. each opamp should only draw appox 5ma. I hate how things work out sometimes. I had a transformer, perfect for this application and installed. Got my low voltage stuff all figured out and everything wired up. Installed the tubes and nothing. The transformer, like pretty much all of its brothers that I bought in a group years ago, is dead. The others in the batch all have dead HV secondaries and this one appears to have a bad primary. Worked when I tested it before installing it! I'll try to get a replacement transformer in this week before I spend 3 weeks in Brazil. Oi ...now I'm really on pins and needles. Even if I have to halfass an overkill transformer on a variac and connect the heaters to my DC bench supply I'm going to get sound out before I go. Before you go to Brazil? ..
Another 3 week wait will get me biting my nails. It was ghetto(pic below) and it had some hum but it worked. Eventually. I got sound out of the left channel only at first, turns out a cable inside the chassis got damaged and the right channel sound lead is both cut and grounded within a wire. I cut that channel at the volume pot and made it mono for the test. 90% sure the hum is from having the DC filament supply, the variac, and the receiver itself all plugged into outlets haphazardly. Either way, it sounded great! The 201 speakers I had connected to the thing worked well and I was really surprised at how loud and clear it was in the office. My wife is going to love it. I should have internet where I am going and I will have plenty of down time so expect some posts in the coming weeks with a double sided board with sockets arranged so that any of the 3 tubes can be chosen for use(6V6, 6AQ5, or 5902).